Here’s how Persistent Systems aided the Biocomplexity Institute of Virginia Tech in using analytics to predict and help prevent the spread of infectious diseases. What’s the best weapon to fight the spread of infectious disease? For the epidemiologists at The Biocomplexity Institute of Virginia Polytechnic Institute and State University (BI-VT), it’s data. 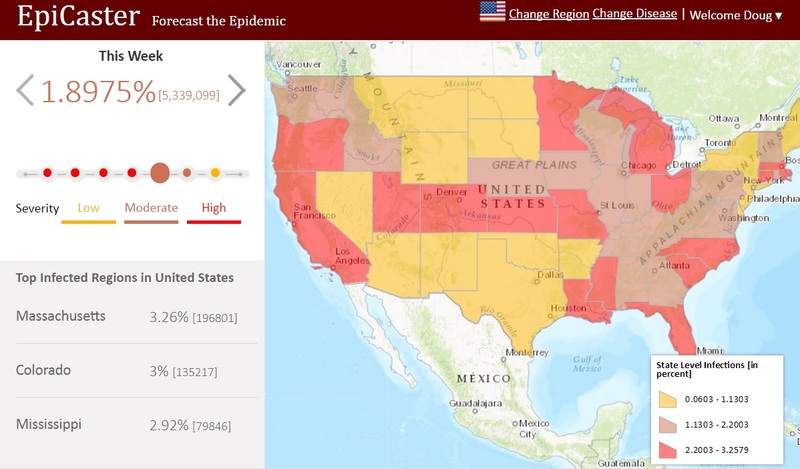 BI-VT helps U.S. government agencies such as the Department of Defense, National Institutes of Health, and Center for Disease Control to predict, prepare for, and prevent the spread of infectious diseases such as Ebola and Zika. With help from Persistent Systems (Persistent), BI-VT has dramatically increased the speed, scalability and accuracy of its analytical modeling and simulation environment. The Biocomplexity Institute’s EpiCaster app, which was co-developed by Persistent Systems, is an intuitive, public website for tracking flu and other diseases. The collaboration between BI-VT and Persistent is the topic of my latest case study research, Persistent Systems Helps Virginia Tech Accelerate Predictive Simulation. This 14-page case study should be of interest to any analytics professional interested in using high-performance computing, speeding time to analysis, tapping new data types, or opening up analysis capabilities to non-technical users. With help from Persistent, BI-VT achieved all of the above. With leadership from Professor Madhav Marathe, Director of the Network Dynamics and Simulation Science Laboratory (NDSSL) at the Biocomplexity Institute, BI-VT has pioneered graph simulation techniques that have vastly improved the prediction and prevention of disease outbreaks. But you don’t have to be an epidemiologist to appreciate the obstacles BI-VT had to overcome. For example, the simulations initially required complex, manual coding for each one of scores of high-performance computing jobs. What’s more, iterative analyses took a day or more to run, and the analytical tools were usable only by the few experts. Sound familiar? The first step to addressing these challenges was creating a middleware layer that abstracted and automated the coding and iterative complexities of BI-VT’s data-analysis environment. The software engineers at Persistent helped turn a slow, manual workflow into a streamlined, reliable and resilient production system. Persistent also developed graphical user interface applications (such as the EpiCaster app seen above) that have made the system accessible to non-technical analyst and even the general public. Over more than a decade of tracking diseases ranging from H1N1 and SARS to, more recently, Ebola and Zika, BI-VT has been able to simulate and recommend data-supported interventions and containment steps, many of which have been implemented by government agencies. Examples include administering antiviral drugs to emergency personnel, inoculating the young and aged, spraying pesticides to curb mosquito populations, and encouraging the public to stay indoors.